Hit Trax has the largest catalogue of MIDI and MP3 backing tracks by Australian bands and performers. The catalogue covers artists from the 50's & 60's rock pop era, classic 70's rock, 80's & 90's retro classics and current Top 40 Australian chart hits. 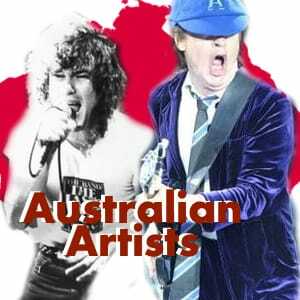 Find artists from Johnny O'Keefe to Billy Thorpe, AC/DC to Crowded House, INXS to Midnight Oil, Tina Arena to Australian Crawl along with the latest new and exciting Aussie bands and performers.